An example of rather pointless symmetry would be to post a review about a song named for a day of the week on the day of the week the song is named for. But appropriate symmetry is posting a review about a boring song on the day of the week that historically is the most boring of the seven days we have to choose from. Well, actually if that’s your idea of a good time then you still need to get out more on Saturday nights, but fear not, if you’re looking for a way to hopefully make a Sunday go by a little bit faster this might do the trick. If not, well, it’s not as if you’re missing much in the outside world on the Sabbath. We won’t waste time giving this too much of a build up since originally we weren’t going to bother covering this at all, which pretty much lets you know what kind of a record we’re dealing with. But as you can see here it is all the same. The reason is simply to try and better set up the career arc of an artist who vacillated between extreme lows and a few sporadic highs. Without delving into the lows to off-set the better work to come there’s no real sense of achievement when we get to the good stuff. This however is anything but the good stuff. It’s intentionally bad as a matter of fact, at least using a rock ‘n’ roll barometer… which brings us to the other reason this got an entry after initially being left out altogether and that’s the mindset the major record labels had when it came to this music. For those who have already forgotten the rather unmemorable initial efforts by Powell last spring, the basic story is this: The band was nothing more than a club act around Philadelphia, successful enough that they could earn their living playing music but not so successful that record companies were beating down their door to sign them to a contract. But then rock ‘n’ roll, which had only just begun in mid-1947, started to become far more commercially successful than anyone had dreamed possible and by early 1949 there was more than enough evidence that this upstart brand of music might have staying power. The thing about it though was that rock ‘n’ roll was virtually the exclusive domain of small independent record labels because the younger black audience who fueled its rise was the one demographic the stuffy major labels had been avoiding like the plague. That left the field wide open to be exploited by these fly-by-night indies and now they were cleaning up on it, much to the consternation of the big boys. It’s not that the majors [Columbia, Decca, RCA-Victor and Capitol] wanted to sully themselves with this type of music, or frankly with the black audiences who bought this stuff, but money is money and sales are sales and surely the well established companies were entitled to reap the benefits of any music that was deemed appealing by somebody in the American wilderness. So with a mixture of arrogance and ignorance the major labels jumped into the fray… not to compete on level ground with the originators of rock by using their prolific resources to sign the best of the next generation of genuine rockers coming up and hire sympathetic producers willing to let them do their thing, but rather their goal was to condescendingly look down upon the whole thing and crassly attempt to dupe a public they deemed unworthy of respect by issuing flaccid facsimiles of the style. Needless to say their shallow insincere efforts were doomed to fail. Columbia Records had signed two atypical acts to serve as their designated rock artists. The Five Scamps had initially surprised everyone when they actually proved to be far more than token entrants with their first two simultaneous releases back in March, including the scalding Red Hot. Columbia apparently was unprepared for the real deal and subsequently scaled back their output to songs that were only hinting at rock without doing too much to prove it. With Chris Powell and The Five Blue Flames the venerable record company seemed to be taking even less chances with anything too authentic and the group’s first session in April produced four underwhelming sides, none of which could be called even average attempts at rock let alone cutting edge. Instead the label was intent on passing off a neutered form of the music, if not an out and out pop-slanted perversion of it, to merely suggest the group were rockers and hopefully benefit from the cachet associated with the music. Not surprisingly Columbia badly misjudged the tastes and intelligence of the rock audience who weren’t fooled for an instant by these novelty offerings, that is if they even were aware of them in the first place. 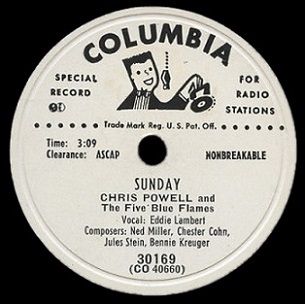 The label had probably figured that with their better distribution and respectability these records would have a leg up on the comparatively cash-strapped indies who had cornered the market on rock, but the difference was those companies had cultivated relationships with the retail outlets and jukebox operators who actually sold to the black community, whereas Columbia had not. Maybe if they had a record that gave them the unadulterated sounds they craved they might’ve overcome this built-in disadvantage, but instead they served up tepid mush like Sunday, a song dating back to 1926 that was the antithesis of the forward looking mindset rock ‘n’ roll inhabited. Any guess as to where THIS is headed? 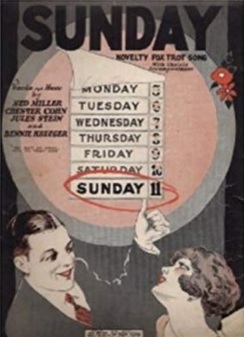 Written by Chester Cohn, also known as Chester Conn, with lyrics by Jule Styne, Bennie Krueger and Ned Miller, it was the type of pleasant inoffensive stuff that was popular at that time, jaunty music with a story about someone longing for their prospective partner whom they see just one day a week. But rather than explore the intense emotional longing of this situation they gloss it over with bland generalities. As such there wasn’t much chance for anybody to take the raw materials presented in the composition and resuscitate it enough to make headway a quarter century later with a fan base who spent most Sundays sleeping off hangovers from Saturday nights. My guess is Chris Powell, drummer, frequent singer and bandleader of this outfit, was a genial sort of guy. I’m not just going by pictures of his doughy face with his agreeable dazed expression, but by the fact he’d even consent to cut songs like this in the first place, ones that had absolutely no chance to establish his group as anything more than puppets of a record company hopelessly out of step with the emerging market. Even were Powell to claim he felt Sunday could be presented in a far different manner than every rendition that preceded it, this surely isn’t it. The first sound coming through the speakers are light drums and while they aren’t anything to get your heart rate moving they’re actually one of the best aspects of the entire record, which is a bad omen to say the least. Once the others join in it takes on the veneer of something so out of date, not just the manner in which it’s played, but also the approach the producers felt would best sell this. There’s even a gimmicky “doink” sound right before the vocals kick in, all of which tells you this record is sunk before the first words are uttered. It’s not Powell though who will be uttering them, but rather guitarist Eddie Lambert, whose voice is dry and airy, lacking strength, resonance and conviction in equal measures. He sounds like a 75 year old who is spryly hamming it up at a family gathering that has you hoping his rheumatism will kick in and render him unable to continue. Technically speaking it might not be the worst vocal we’ve encountered so far, he’s doing what the song calls for after all and is at least hitting most of the notes, but it’s so intentionally bland that it’s the aural equivalent of Cream Of Wheat. Even if it will be used in the future as a comparison piece to something far more appropriate in the rock realm, there’s been nothing so far that gives Sunday any right to the claim of a rock record. But hold on, what gets it a pass into this discussion – albeit still with severe reservations – is some of the elements in the instrumental section. Most of it is pretty musty sounding, even the tenor sax which is a welcome sight in most records is being played here in a manner that is far away from what we’ve come to expect. The instrument’s tone is about all that connects it to rock ‘n’ roll and barely at that. It’s not awful mind you, just awfully drab. The same can’t be said when Lambert shuts his trap and stops singing and picks up his guitar and starts playing. His ten second solo just over a minute in is the one redeeming section of this mess. It’s not so much invigorating as it is interesting, as he plays with a light touch, bending notes as he snakes his way through the melody. It’s not amplified nearly enough and sounds buried in the mix as a result, not to mention being far too short to really get your motor racing, but there’s an admirable precision to his licks, an adroitness that stands out amidst the dull workmanlike technique of the others. This difference between approaches is highlighted by Duke Wells’s ensuing – and interminable – piano solos which attempt to sound joyful and carefree but only serve to show how those definitions themselves belong to another age. The same of course can be said of the song itself, which is archaic even for pop of 1949, let alone rock ‘n’ roll, something it has no right to be called no matter what Columbia Records thought. It’s hard to see based on this performance what The Five Blue Flames had going for them which made them reasonably popular draws in the Philadelphia club scene prior to their recording career. Who was dressing up to go out and spending good money on food and drink to be put to sleep by these guys? Even if Sunday wasn’t the type of song they were doing when left to their own devices the fact they can’t embellish this with anything more than a muted ten second guitar solo to make you take notice indicates their decent reputation was undeserved. Furthermore why Columbia thought these guys could pass as rockers, even the label’s watered down interpretation of the term, is a mystery. Or why they’d insist on having them cut a song that only emphasized their lack of credibility rather than tried masking it is an even bigger mystery. What’s not a mystery is why this record sank without a trace. Though it can reasonably be said that they don’t butcher it by hitting the wrong notes or drunkenly singing it off-key, the performance probably would have been more entertaining if they had. I guess this is just one more example of what happens when you let your grandparents try and pick out your clothes for a wild Saturday night party. It’s no wonder they’re more suited for stuffy Sunday dinners where if you’re lucky they’ll doze off before desert so you can sneak out and shed this outdated wardrobe before it causes a rash. Leave a reply on "Chris Powell And The Five Blue Flames: “Sunday”"